Original Editors - Colleen Mathews from Bellarmine University's Pathophysiology of Complex Patient Problems project. Neuroblastoma is a form of cancer that originates in the nerve cells, specifically within the sympathetic nervous system. The cancer is found in the primitive cells of a fetus or an embryo, and then the cancer cells proliferate in the young child. The cancer typically arises from the following areas of the body: retroperitoneal area, posterior mediastinum, pelvis, and neck. Neuroblastoma is most commonly diagnosed in children under the age of 5 years old, but can be diagnosed in older children as well. Neuroblastoma is the most common form of cancer in infants under the age of one year old and accounts for approximately 28% of all infant cancers. Neuroblastoma is the most common form of cancer death in this population at an incidence of 65 per million infants under the age of one year. This form of childhood cancer is the most commonly diagnosed extracranial solid tumor. Currently in the United States, new neuroblastoma cases are being diagnosed at a rate of over 500 children a year. The prevalence is slightly higher among Caucasians compared to non-white children. In comparison to all other childhood cancers, neuroblastoma accounts for 7.8% of cases out of all childhood cancers worldwide. About 1/100,000 children are diagnosed each year. of its manifestation and the size of the tumor. 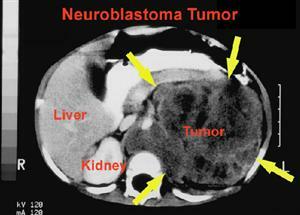 The neuroblastoma presentation changes if the cancer has spread (metastasis), and if the tumor secretes hormones. At the time of the patient's diagnosis, neuroblastoma cells have already spread to other parts of the body 73% of the time. The common signs and symptoms of the patient include the following descriptions. 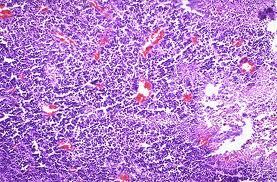 Palpable Mass: A lump can be found in a variety of locations in a child with neuroblastoma. The abdomen is the most common location to find a mass. The child may present with swelling around the location of the mass, have complaints of discomfort or pain, and may refuse to eat. The lump maybe palpable, but is often not painful or tender to the touch. The child may also have high blood pressure from the tumor pressing on the abdominal aorta or other large blood vessels in the abdomen. Edema: If the lymph and blood vessels are blocked due to pressure from a tumor, edema will accumulate. Accumulation of swelling is common in the legs, and it is common to have swelling in the male scrotum. The clogging of the blood vessels will prevent the fluid from circulating properly through the body and back to the heart. Bowel/Bladder Changes: A tumor located near the bladder or colon can affect urination and bowel movements. The patient may either have an increase or decrease in bowel and bladder dysfunction, and/or discomfort in the lower abdominal region. Facial Edema: Tumors located in the neck near the superior vena cava can cause swelling in the neck or head region. The child may complain of or demonstrate a difficulty with swallowing and breathing. Weakness/Movement Dysfunction: The patient may present with a decrease in strength, decreased sensation, and decreased motion due to a tumor located near the spine that is applying pressure to a nerve root. If the patient is walking, an antalgic gait maybe noted. The patient who is not walking yet will demonstrate with decreased extremity motions. Proximity of the tumor to the nerve root or spinal cord can cause compression on the cord leading to radiculopathy. Signs of radiculopathy include weakness, numbness, tingling, etc. primarily in a dermatome distribution. Visual Changes: The patient may present with drooping eyelids (ptosis) and decreased pupil size (miosis) due to pressure on Cranial Nerve III, occulomotor nerve. Dypsnea: A patient with a tumor located in the chest cavity may present with shortness of air and experience difficulty swallowing. Limping/Pain During Ambulation: Neuroblastomas commonly metastasize to the bone and cause pain during ambulation or generalized pain in the bones. A child with neuroblastoma metastasized to the bone may present with an antalgic gait, increased pain with movement, and decreased strength. If the cancer spreads to the vertebral column, the patient may have weakness, decreased sensation, and possibly even paralysis in the extremities due to pressure on the spinal cord from the tumor. Larger bones are common metastasis sites for infants. The proportionally larger bones include the femur, humerus, and skull. blueberries may appear on the skin if neuroblastoma has spread to the integumentary system. Visual Changes: Bruising surrounding the eyes may indicate the tumor has spread to the ocular region. The patient may also present with a protruding eye or eyes. 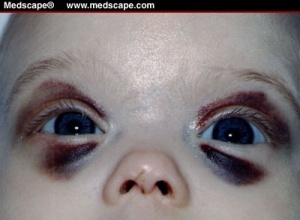 Ecchymosis or swelling of the eye gives the appearance of raccoon eyes. This presentation is common in children with tumors in the orbital region. It is hypothesized that the metastasis of tumors to the orbital region is due to the proportion differences in an infant regarding their larger skulls in comparison to their skeleton. A rare presentation of neuroblastoma in the paraneoplastic syndrome category is a patient with dancing eyes/dancing feet syndrome, also known as opsoclonus-myoclonus-ataxia syndrome. This syndrome includes muscle spasms, uncoordinated movement, rapid eye motions, and difficulty speaking. The hypothesized cause of opsoclonus-myoclonus-ataxia syndrome is the immune cells in the body attempt to fight off the cancer and confuse healthy cells, such as brain cells, for tumor cells. In other words, the brain gets caught in the crossfire of the immune systems fight and the effects are opsoclonus-myoclonus-ataxia syndrome. Associated co-morbidities of neuroblastoma include; Down syndrome, genetic abnormalities, AIDS, radiation exposure, chemo and radiation therapy. Research has found that focal nodular hyperplasia of the liver is demonstrated approximately ten years after diagnosis. Organ failure is common after treatment for neuroblastoma including, Liver failure, Kidney failure, decreased immunological resistance, loss of blood cells produced by bone marrow. A presentation of a genetic link has not been confirmed. Neuroblastoma can occasionally associated with children with neurofibromatosis, Beckwith-Wiedemann syndrome, and nesidioblastosis, a pancreatic condition. Chemotherapy is a non-selective drug that destroys fast growing reproducing cells at particular stages in the growth cycle. The most common chemotherapy drugs used to combat neuroblastoma are: epotoside, daunorubicin, carboplatin, and cyclophosphamide. Chemotherapy is most commonly administered by IV. The drug is utilized for neuroblastoma tumors that are located in the liver, lungs, lymph nodes, bone marrow, and variety of other organs. Chemotherapy is most commonly used in tandem with surgery as a neoadjunctive or adjunctive therapy. lingering tumor cells following surgery of a tumor, reduction of tumor size prior to the surgery, treatment of large tumors that may not be affected by chemotherapy, in tandem with chemotherapy as part of high dose therapy including stem cell transplant (high risk neuroblastoma patients), and finally for pain relief. Radiation destroys cancer cells by sending energy forming ions into the cancer cells which dislodges the electrons from the atoms. The result is radiation can destroy the cancer cells or change the genes. Similar to chemo, radiation cells destroy cells that are dividing. Surgery can be performed in order to remove the entire tumor or portions of the tumor, followed by radiation or chemotherapy. Tumors that have metastasized or grown into areas of high risk may not be completely removed through resection. High risk areas of tumor removal would include major blood vessels, organ involvement, and nerves. Stem Cell Transplant Therapy is used for patients who are diagnosed with high risk neuroblastoma. These patients are unlikely to improve with other treatments. Stem cell transplant involves collecting the child’s own blood to form new stem cells. The process is called apheresis, in which the blood that is collected is ran through a machine that partitions the stem cells from the blood, and then returns the blood back to the child’s body. The stem cells are then stored for future usage. 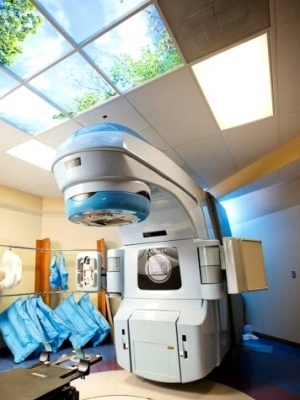 The patient is then treated with high dose radiation and chemotherapy. Following the treatment the patient’s stem cells are returned to the patient’s body similar to the process of a blood transfusion. Over the course of 3 to 4 weeks the stem cells begin to form healthy blood cells in the bone marrow. There is a high risk of infection and bleeding during this treatment due to a decreased platelet count. Immunotherapy includes therapy that is both passive and active. Active therapy utilizes the current immune system to fight against the pre-existing cancer cells. Cancer vaccines are also available to only destroy cancer cells. Passive immunotherapy uses man-made immune proteins such as monoclonal antibodies. If a child presents with signs and symptoms listed above, a scheduled physical exam should be scheduled for further testing. The doctor will need to take a thorough history including medical, surgical, medicinal, etc. The following diagnostic and lab tests might be administered to diagnose a neuroblastoma. Blood and urine tests can detect neuroblastoma from the catecholamines present. A patient will present 9/10 times with catecholamines or its metabolites present in the urine if they are positive for a neuroblastoma. Catecholamines are hormones released by the sympathetic nervous system, and the presence of a neuroblastoma can increase the amount of catecholamines in the urine or blood. The common catecholamines that are measured during these tests are HVA (Homovanillic acid) and VMA (Vanillylmandelic acid). Blood tests will reveal a high level of norepinephrine or dopamine which is common sign in patients with neuroblastoma. MIBG Scan is a radioactive scan involving an injection of metaiodobenzylguanidine into the vein of a patient who has a suspected neuroblastoma. The tumor takes up the compound and a scan of the body is preformed, sometimes multiple scans are taken up to 1-3 days. The scan locates and determines the extent of the neuroblastoma. Imaging is a variety of scans utilized to determine the diagnosis of neuroblastoma. Since neuroblastoma is diagnosed often after it has metastasized to other areas, multiple imaging could be utilized to determine the extent of metastasis. Biopsy of a neuroblastoma tumor includes dissecting the tumor and then the cells will be analyzed by a pathologist for signs of cancer. The biopsy can be of a tumor or of the bone marrow. If the bone marrow is analyzed a long hollow needle is inserted into the sternum or illium. The cells are then analyzed by a pathologist for cancer. The cause of neuroblastoma is unknown, and it is noninfectious. Neuroblastoma can sometimes be connected to a genetic link from a parent or family member. It is rare that a genetic link between a parent and a child can be connected. Neuroblastoma left untreated can metastasize to other systems in the body mentioned above in the Characteristics/Clinical Presentation. The multiple systems can be affected by a primary or a metastasized tumor. Treatments for neuroblastoma such as chemotherapy and radiation can affect multiple systems. The following systems can be affected including; Nervous System, Musculoskeletal System, Gastrointestinal System, Urogenital, and Cardiopulmonary, Reproductive, and Integumentary System. Quality of life is an important theme when it comes to treating children with neuroblastoma and any form of childhood cancer. Side effects of the cancer treatment/medication (chemotherapy, radiation, etc.) and symptoms of the cancer itself can lead to a risk of the following musculoskeletal and neurological issues. The effects are not isolated to physical losses, but also include psychosocial changes as well. The following are included in psychosocial considerations when treating a child with neuroblastoma and cancer. Research has also found late effects of childhood cancers including the following presentations. The above presentations are important in screening and for determining the physical therapy treatment of a child who presents with cancer or neuroblastoma. Physical therapy treatment should include a variety of considerations to address the limitations or deficits of the individual patient. When it is possible therapists can utilize group therapy to decrease social isolation and to develop psychosocial benefits. 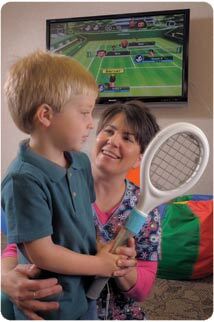 Wii rehabilitation treatment can address many deficits in the child with cancer such as balance, strength, and endurance. It is recommended by the ACSM (American College of Sports and Medicine) for cancer patients to perform 30-45 minutes of cardiovascular exercise, 3-5 days a week. The patient can walk, bike ride, etc. to develop cardiovascular benefits, strength, and maintain functional activities. Research has found that patients who exercise at this recommended level have increased endurance, decreased nausea, decreased overall fatigue, and an increase in their overall quality of life. Overall, PT treatment has been proven through research to benefit the quality of life in a cancer patient of either a terminal or treatable diagnosis. Stage 1: The percentage of children diagnosed at this stage is 21%. The primary tumor is located and isolated to one area of the body. The lymph nodes bilaterally are negative for cancer. The neuroblastoma cancer in this stage can be removed by surgery. Microscopic residual cancerous tissue may remain after removal of the tumor. 2A: The primary tumor at this stage is confined to one area. However, it cannot be completely removed through surgery because of its larger size, proximity to other organs, or general location. The lymph nodes are negative bilaterally on both sides of the body for metastases. 2B: The primary tumor at this stage is confined to one area of the body. The tumor may or may not be completely surgically removed. The lymph nodes on the side of the body where the tumor is located are positive for metastasis of neuroblastoma. The lymph nodes on the opposite side of the body are negative for metastasis. Stage 3: The percentage of children diagnosed at this stage is 17%. The following descriptions of presentations are Stage 3. The first presentation of stage 3 occurs when the primary tumor crosses the spinal cord region/midline of the body. The lymph nodes may or may not present with metastasis. The second presentation of stage 3 could be the primary tumor is located on one side of the body, while metastasis is found in the lymph nodes on the opposite side of the body. The third presentation of stage 3 could be the primary tumor is located on one side of the body while metastasis is found bilaterally in the lymph nodes. Stage 4: The percentage of children diagnosed at this stage is 41%. This stage presentation occurs when neuroblastoma cells are found in the distal lymph nodes, liver, bone marrow, or additional organs. 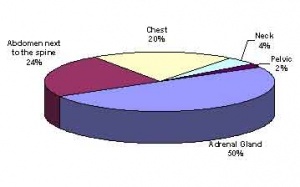 Stage 4S: The percentage of children diagnosed at this stage is 6%. The presentation at this stage is typically found within infants. The primary tumor is isolated to one area of the body, but the tumor has metastasized to other regions of the body such as bone marrow, liver, or skin. Bone metastasis is rare in this category, with less than 10%. Additional Differential Diagnosis: Rhabdomyosarcoma and Wilms Tumor. ↑ 1.0 1.1 1.2 Mayo Clinic: neuroblastoma. http://www.mayoclinic.com/health/neuroblastoma/DS00780 (accessed 9 March 2011). ↑ 2.00 2.01 2.02 2.03 2.04 2.05 2.06 2.07 2.08 2.09 2.10 2.11 2.12 2.13 2.14 American Cancer Society: neuroblastoma. http://www./Cancer/Neuroblastoma/DetailedGuide/neuroblastoma-what-is-cancer (accessed 2 March 2011). ↑ 3.0 3.1 3.2 Goodman CC, Fuller KS. Pathology: Implications for the Physical Therapist. 3rd edition. St. Louis, Missouri: Saunders Elsevier, 2009. ↑ 4.0 4.1 4.2 4.3 National Cancer Institute: neuroblastoma. http://www.cancer.gov/cancertopics/types/neuroblastoma (accessed 9 March 2011). ↑ 6.0 6.1 Ped-Onc Reference Center: neuroblastoma. http://www.ped-onc.org/diseases/neuro.html (accessed on 4 March 2011). ↑ 7.0 7.1 MacMillan Cancer Support: neuroblastoma. http://www.macmillan.org.uk/Cancerinformation/Cancertypes/Childrenscancers/Typesofchildrenscancers/Neuroblastoma.aspx (accessed on 4 March 2011). ↑ 9.0 9.1 9.2 9.3 9.4 Goodman, Snyder. Differential Diagnosis for Physical Therapists: Screening for Referral. St. Louis Missouri. 2007. ↑ 11.0 11.1 Medscape Reference: neuroblastoma. http://emedicine.medscape.com/article/988284-clinical (accessed 9 March 2011). ↑ Benz-Bohm G, Hero B, Gossmann A, Simon T, Körber T, Berthold F. Focal nodular hyperplasia of the liver in longterm survivors of neuroblastoma: How much diagnostic imaging is necessary? European Journal of Radiology 2010;74 (3): pgs 1-5. http://www.ncbi.nlm.nih.gov/pubmed/19369017 (accessed 10 March 2011). ↑ 14.0 14.1 PubMed Health: neuroblastoma. http://www.ncbi.nlm.nih.gov/pubmedhealth/PMH0002381/ (accessed on 3 March 2011). ↑ 15.0 15.1 15.2 15.3 15.4 15.5 15.6 15.7 Miale, S presenter. Improving the Quality of Life of Children with Cancer: The Role of Rehabilitation. Presented at Combined Sections Meeting of the American Physical Therapy Association; 2011 February 9-12; New Orleans, Louisiana. ↑ 16.0 16.1 16.2 16.3 Children's Neuroblastoma Cancer Foundation: neuroblastoma chemotherapy. http://www.cncfhope.org/Neuroblastoma_Chemotherapy (accessed 8 March 2011). ↑ Cancer Supportive Care Programs: exercises for cancer supportive care. http://www.cancersupportivecare.com/exercise.html(accessed on 2 April 2011). ↑ 19.0 19.1 19.2 19.3 19.4 19.5 Children's Neuroblastoma Cancer Foundation: neuroblastoma staging. http://www.cncfhope.org/Staging_Neuroblastoma (accessed on 7 March 2011).